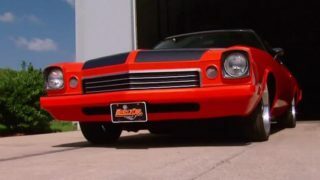 The guys begin what will be an iconic build when they team up with Chevrolet Performance to build a tribute to one of the most legendary muscle cars ever made: a 1969 ZL1 COPO Camaro. 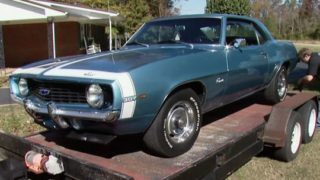 An all-aluminum ZL1 Big Block gets plugged into the '69 COPO Camaro tribute, and the floor is modified to receive a conversion from automatic to 4-speed. Also, find out why trim pieces tend to pit so badly over time, and how to revive a barn find car without catching it on fire! 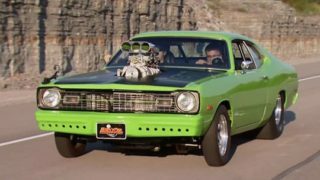 The guys plug in their revamped front and rear, then modify the car to accept manual floor pedals and a big-block style heater core. After that, it's tons of tech on brake lines and fuel lines. 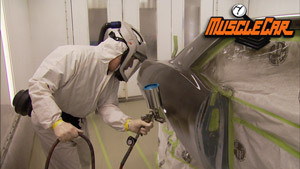 Using a self contained paint sytem, the guys take the COPO Camaro Project from rough body work all the way to painted and buffed out. Learn how you can improve on the classic Muncie 4-Speed with modern technology, as well as the available tools to remove glass and more, and preventing raw metal rust. 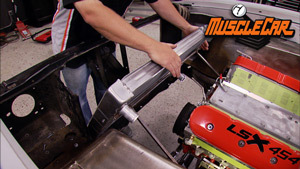 The guys work on rescuing several factory components on their 1969 COPO Camaro Tribute Project. 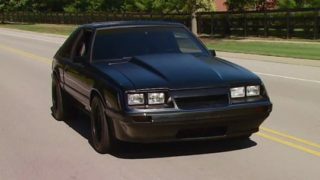 A seat frame fix, a big-buck saving steering column rebuild, and an everyman plastic grill repair are in store, plus Flashback takes a look at another famous Camaro. 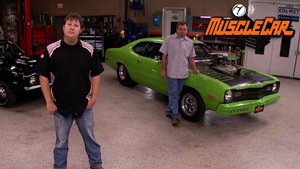 The MuscleCar guys work on getting the interior into the 1969 COPO Camaro Tribute project, and Tommy addresses an often neglected part of a restoration - the trunk floor. Then the COPO gets headers and exhaust. RECIPE FOR A PHONE CALL TO A TOW TRUCK. TODAY WE SHOW YOU HOW TO BUILD YOUR OWN BEEFY GM 12 BOLT FOR A FRACTION OF THE COST OF BUYING ONE. THEN A COOL TRICK TO INSTALL COIL SPRINGS! BOLT SETUP, WHICH IS PERFECTLY FINE FOR THE 307 THAT THIS CAR HAS ALWAYS BEEN RUNNING. BUT THE GM BIG POWER CARS OF THE DAY WERE RUNNING A 12 BOLT SETUP. THAT WAS MORE CAPABLE OF HANDLING THE ABUSE. SO TO KEEP OUR CAMARO ON THE RIGHT TRACK WE NEED TO INSTALL A 12 BOLT. THE PROBLEM IS THOSE THINGS CAN GO FOR UP TO $2,000 JUST FOR AN EMPTY HOUSING. I'VE SEEN IT AT THE SWAP MEETS, BUT I BELIEVE I CAN BEAT ALL THAT. GO FROM BRAKE DRUM TO BRAKE DRUM WITH UPGRADED PARTS FOR LESS CASH. SO THIS IS MY IDEA, IS TO TAKE A 12 BOLT REAR OUT OF AN IMPALA, CHOP IT DOWN, NARROW IT UP SO IT'S THE SAME WIDTH AS THE ONE FOR THE CAMARO. THAT WAY WE'LL HAVE US A STRONGER UNIT WHEN WE'RE ALL SAID AND DONE, AND IT'LL BE EASIER ON YOUR WALLET TOO. THESE LUG NUTS HAVEN'T BEEN OFF IN WHO KNOWS HOW LONG. SO A LITTLE ROYAL PURPLE MAX FILM WILL GO A LONG WAY IN GETTING THEM OFF THE STUDS. THE NEXT RUSTY OLD PART THAT'S STUCK ON THE REAR IS THE BRAKE DRUMS. SOMETIMES YOU CAN SAVE THEM. THAT'S NOT LOOKING LIKE IT'S GONNA BE THE CASE HERE THOUGH. WELL, WE'RE FIXING TO TRY SOMETHING THAT NORMALLY YOU DON'T REALLY BUT SOMETIMES YOU GOT TO. I'M GONNA TRY TO SPLIT THIS BRAKE DRUM TO RELEASE THAT PRESSURE IN THERE. I'M GONNA HAVE TO SACRIFICE THAT OLD BRAKE DRUM, BUT I DON'T THINK IT'S ANY GOOD NO HOW. ARE THAT DRUM WAS WAY TO RUSTY TO EVEN FOOL WITH. SO, YEAH WE DID DESTROY IT, BUT IT WAS ALREADY PIECES OF SCRAP IRON BEFORE WE GOT STARTED. WHOO, I'M OUT OF SHAPE. YEAH, SEE THE PAINT. NOW SOMETIMES IF YOU CAN'T GET THE BRAKE DRUMS OFF IT'S ACTUALLY CORROSION BUILT UP AROUND THIS STUB ON THE AXLE SHAFTS. SCRAPE THIS STUFF OFF, I MAY HAVE TO FILE IT OFF. MAKE IT A LITTLE EASIER TO GET SOME THINGS OFF. DEFINITELY CAN'T HURT. BUT INSTEAD OF WORKING WITH THIS THING TRYING TO SAVE ALL THIS STUFF, WE'RE NOT GONNA USE IT ANYWAYS. SO I'M JUST GONNA BUST IT OFF LIKE I DID THE OTHER TIME. THE THING IS I'M PUSHING THIS BRAKE DRUM OFF. YOU'LL SEE THIS IS ACTUALLY HOLDING ITSELF IN, WHAT I WAS TALKING ABOUT. THAT LITTLE FINGER DOWN, AND THERE'S ANOTHER ONE BACK OFF IN THERE. A COOL LITTLE TRICK TO USE IS A WRENCH. ALL YOU'VE GOT TO DO IS SLIDE IT ON THERE, TAP IT DOWN, THAT COMPRESSES THOSE FINGERS, MAKE THAT CABLE BACK OUT. NOW WE DON'T GET TO USE THE TORCH A WHOLE LOT HERE IN THE SHOP, BUT IT'S ONE OF THOSE TYPE OF TOOLS THAT DEFINITELY HAS ITS USES. NOW USING A TORCH IS ACTUALLY KIND OF A TECHNIQUE I LIKE TO USE WHENEVER CUTTING OFF BRACKETS. WHAT YOU WANT TO DO IS PAY ATTENTION TO THE FLAMES COMING OUT OF THE TIP AND ANGLE IT SO THAT YOU'RE JUST CUTTING ACROSS THE WELD THAT ATTACHES THE BRACKET TO THE REAR. IF YOU TRY TO TURN IT YOU COULD ACTUALLY DIG INTO THE TUBE AND THEN YOU'D HAVE TO GO BACK AND GRIND AND WELD AND FIX ALL THAT TO MAKE IT LOOK LIKE SOMETHING. WE'LL JUST PAY ATTENTION TO WHAT'S GOING ON. ANOTHER THING YOU WANT TO KEEP IN MIND WHEN YOU'RE CUTTING PIECES AND THEY'RE GONNA FALL, MAKE SURE YOU PAY ATTENTION TO WHERE YOUR HOSE IS AT. YOU DON'T WANT THIS TO FALL, CHOP IT IN TWO. (ANNOUNCER)>> CHOPPING UP A REAR END HOUSING CAN BE INTIMIDATING. NEXT WE'VE GOT A GREAT LITTLE PIECE OF ENGINEERING THAT MAKES IT SUPER SIMPLE TO MAKE THIS AFFORDABLE MODIFICATION. UNIT IS RIGHT HERE. A CCLIP ACTUALLY SLIDES IN TO KEEP THE AXLE FROM SLIDING OUT OF THE HOUSING. NOW IF YOU START PUTTING THIS TYPE OF SETUP UNDER SOME HEAVY LATERAL MOVEMENT, THEY HAVE BEEN KNOWN TO BREAK. ALSO IF YOU'RE DRAG RACING SOME AND YOU TWIST AN AXLE OUT, THE SHAFT IS GOING TO RUN OUT FROM UNDER THE CAR AND YOU'RE FIXING TO GO FOR ONE HECK OF A RIDE. THE REALLY NEAT PART OF THIS MOSSIER SETUP IS RIGHT HERE. THIS BIG BEARING AND AXLE HOUSING END ALLOW US TO ELIMINATE THE CCLIP ALL TOGETHER. IN ADDITION TO LETTING US NARROW THE HOUSING EASILY WITHOUT HAVING TO DEAL WITH A WHOLE BUNCH OF JUST EXTRA FAB WORK. THIS PREFAB PIECE IS THE PART THAT ALLOWS YOU TO DO THIS AT HOME. IT'S NOT ALL THAT BAD, LET ME SHOW YOU HOW TO DO IT. 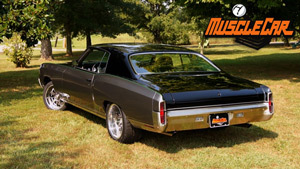 LETS FIND OUT HOW WIDE THE IMPALA REAR IS. THAT WAS 58 AND THREEEIGHTHS. OUR ORIGINAL CAMARO HOUSING IS 54 AND THREEEIGHTHS. WE'VE GOT TO SHORTEN IT ABOUT TWO INCHES PER SIDE. THAT DOESN'T MEAN YOU CAN JUST CHOP OFF TWO INCHES ON EACH SIDE. YOU'VE GOT TO ACCOUNT FOR THIS THING, THE AXLE FLANGE END. IF YOU JUST CUT THE TWO INCHES AND WELDED THIS BACK ON, IT WOULD PUT YOU AT ALMOST EXACTLY WHERE WE STARTED. THAT'S TWO AND THREEEIGHTHS, SO WE'LL JUST ADD THAT TO THE TWO INCHES ON EACH SIDE, CHOP IT OFF, WE'LL BE READY TO GO. ALRIGHT, WE'VE GOT THEM MARKED, FOUR AND THREEEIGHTHS. THEN I'M GONNA USE A HANDY LITTLE OLE HOSE CLAMP. THESE THINGS WORK REALLY NICE AT KEEPING YOUR NICE, STRAIGHT EDGE. NOW YOU MAY HAVE TO WIGGLE IT AROUND A LITTLE BIT TO GET IT EXACTLY WHERE YOU WANT IT, BUT THAT'S THE BEAUTY OF THAT CLAMP, IT'S EASY TO MOVE. MAKE SURE IT'S TIGHT, DON'T WIGGLE AROUND ON YOU. I'M USING A RECIPROCATING SAW BECAUSE A LOT OF YOU GUYS AT HOME WOULD HAVE SOMETHING LIKE THIS. NOW YOU COULD USE A CUTOFF WHEEL BUT YOU DON'T WANT TO USE A TORCH BECAUSE IF YOU START DOING THAT YOU'D HAVE TO COME BACK AND DRESS ALL THAT UP WITH A GRINDER. SO WE'LL SEE HOW THIS WORKS. NOW WE NEED TO LEVEL THE OTHER AXLE IN, THAT WAY WE KNOW HOW TO CLOCK THE OTHER SIDE. THE REASON WE DO THAT IS THAT WAY WE CAN MATCH THE LEFT AND RIGHT SIDE TO MAKE SURE THAT THE BRAKES ARE IN THE PROPER LOCATION. WITH OUR MARK MADE THE NEXT THING WE'RE GONNA DO IS TO BEVEL THIS AXLE TUBE A LOT LIKE THIS AXLE END. THAT WAY IT INSURES A GOOD, SOLID WELD. THE NEXT THING WE'RE GONNA DO IS SLIDE THE AXLE SHAFT IN. GO AHEAD AND SPLINE IT INTO THE CARRIER. THAT WAY WE'RE GONNA USE THE AXLE SHAFT TO HELP LOCATE THIS AXLE END. YOU CAN SEE THAT IT'S GOT UP, DOWN, AND FRONT TO REAR TYPE MOVEMENT ON IT, AND YOU WANT IT TO BE IN THE HAPPY MEDIUM OF ALL FOUR. THAT WAY THE BEARINGS DON'T HAVE PRELOAD ALREADY ON THEM. NOW WITH THAT TACKED INTO PLACE IF YOU SLIDE THE AXLE OUT, YOU WANT IT TO HAVE PRETTY MUCH NO BINDING AT ALL. YOU CAN SEE THAT WE'RE PRETTY MUCH RIGHT THERE AT IT. NOW IT'S TIME TO BURN IT IN. 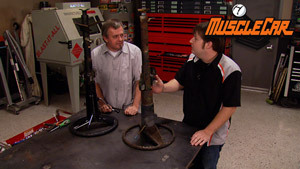 (ANNOUNCER)>> COMING UP, TOMMY SHOWS US A DOWN HOME METHOD FOR SETTING YOUR PINION ANGLE AND BRACKET PLACEMENT. BUT IT'S NOT REAL BIG ISSUE. I'LL JUST TAKE A PIC, SET IT HERE ON THE INSIDE, KIND OF SCRIBE OR SCRATCH. NOW YOU CAN SEE THE AMOUNT THAT WE'VE GOT TO TAKE OFF AROUND THE PERIMETER OF THIS THING TO ENLARGE IT JUST A BIT. NOW WE'VE GOT TO GO GET UP CLOSE AND PERSONAL WITH SOME CUDDLE TIME WITH THE CARBIDE BIT. ALRIGHT, OUT NEXT STEP IS TO TOSS IN A SET OF 4.10 GEARS AND A POS UNIT THAT WE GOT FROM CLASSIC INDUSTRIES. NOW YOU GUYS HAVE SEEN US DO THIS A NUMBER OF TIMES. SO WE'RE NOT GONNA FOOL WITH SHOWING THAT TO YOU RIGHT NOW. BUT IF YOU'RE INTERESTED IN SEEING IT, JUST GO OVER TO POWERBLOCK TV DOT COM AND YOU CAN FIND IT ON THERE. BUT AS FOR NOW I'VE GOT A LITTLE BIT OF WORK TO DO. SO IF YOU GUYS WANT TO STICK AROUND, MANK'S GOT SOMETHING HE'D LIKE TO SHOW YOU. 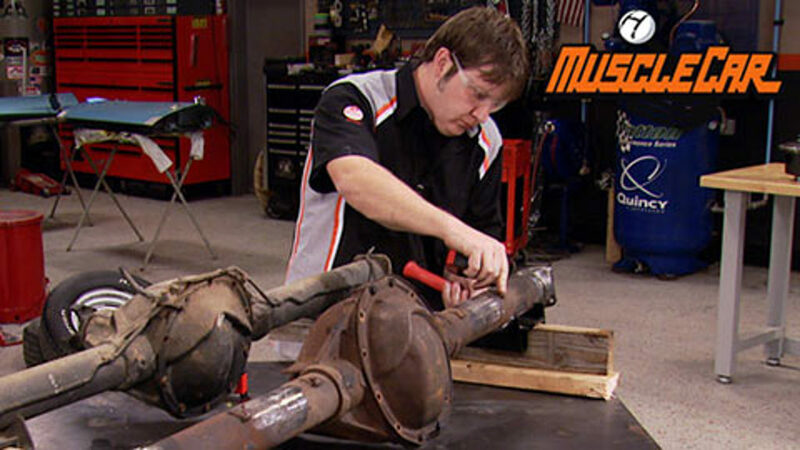 (ANNOUNCER)>> NOBODY LIKES COMPRESSING COIL SPRINGS BUT UP AHEAD WE'VE GOT A GREAT WAY TO DO IT EASILY AND SAFELY. (STEVE)>> HEY GUYS, WELCOME BACK. WHILE TOMMY'S GOT THE 12 BOLT REAR AXLE OF OUR COPO CAMARO TAKEN CARE OF. AND ONCE THE FIREWALL AND THE BELLY OF THE CAR GET PAINTED IT'LL BE READY TO INSTALL. WELL I GUESS SINCE HE DID THE BACK HALF OF THE CAR, I'VE GOT TO GET BUSY ON THE FRONT. SO LETS GET GOING. WE'RE GONNA USE THE FACTORY SUBFRAME THAT WE TOOK OUT OF THE CAR TO KEEP IT AS CLOSE AS WE CAN TO THE ORIGINAL COPO CAMARO. 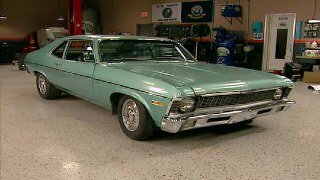 ONCE WE DETACHED IT FROM THE CAR AND TOOK OFF ALL ITS RELATED COMPONENTS, WE TOOK IT TO LEBANON, TENNESSEE, TO OUR FRIENDS AT BLAST FROM THE PAST. THEY COMPLETELY BLASTED IT OF COURSE WITH MEDIA TO GIVE US A CLEAN SLATE TO WORK WITH. AFTER WE RETRIEVED OUR FRONT END AND ALL OF ITS PARTS, WE ROUNDED UP OUR RESIDENT PAINT GUN SLINGER, TOMMY, AND HE CAMPED OUT IN THE SPRAY BOOTH FOR A LITTLE WHILE AND GOT AFTER IT WITH SOME SATIN BLACK PAINT, WHICH WILL HELP US KEEP THE FACTORY LOOK WE WERE CHASING AFTER. LOWER CONTROL ARMS IN THE CAR ALONG WITH THE COIL SPRINGS. IF YOU'VE DONE THIS YOU KNOW IT'S NOT A FUN JOB. WHERE THE DANGER LIES. IT MAKES IT A LOT SAFER. FACTORY STYLE DRUM ONES. IT'S TIME TO PUT A STEERING BOX IN OUR SUBFRAME. WE'VE OPTED FOR A 16 TO ONE MANUAL UNIT THAT WE GOT FROM CLASSIC INDUSTRIES. WE DECIDED TO GO WITH A 16 TO ONE UNIT BECAUSE THIS IS GOING TO BE A PERFORMANCE ORIENTED CAR. WE WANT TO BE ABLE TO MAINTAIN TIGHT STEERING CONTROL AND THIS ONE TURNS MORE QUICKLY THAN THE 20 AND 24 TO ONE MODELS THEY ALSO OFFER. OVER FROM DRUM TO DISC. WELL THERE YOU, THE BASIC FRONT END REBUILD WE'VE DONE ON OUR '69 CAMARO INCLUDING SUSPENSION, BRAKES, AND STEERING ARE PRETTY SIMILAR TO MOST CARS FROM THE MUSCLE CAR ERA. WERE LOOKING FOR BUT GIVE US THE PERFORMANCE WE WERE AFTER. IF YOU GOT ANY QUESTIONS ABOUT ANYTHING YOU SAW ON THE SHOW TODAY. (TOMMY)>> GO OVER TO POWERBLOCK TV DOT COM.